Happy National Shrimp Day! If you're a big fan of shrimp as much as my boys are, this recipe is for you! 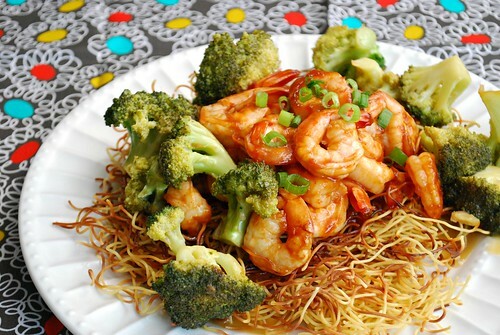 This Sweet & Sour Shrimp is tossed with a flavorful sauce and served over crispy noodles with broccoli. Although made in my Instant Pot, it doesn't get pressure cooked. Instead, the Saute mode makes it easy to use as an electric skillet! Shrimp is one of our favorite seafood and we particular like how versatile it is to work with. Not only does it cook quickly, it takes on flavors easily too. The sweet and sour sauce is easy to whisk together and is a nice blend of flavors - not too sweet nor sour. Also cooking with dark sesame oil really adds a depth of flavor and hint of smokiness to the broccoli. You could toss both the broccoli and shrimp in the sauce, but I prepared it below with the broccoli without the sauce so I could retain that sesame oil flavor. To serve, I plated this over rice or crispy noodles. Press SAUTE on the IP and add the sesame oil. When shimmering add the broccoli florets and saute for 3 minutes. Add water, then cover; Cook for 3-5 minutes until broccoli has steamed and water has evaporated. Add the canola oil over the broccoli, followed by the shrimp. Stir fry and cook for 3-5 minutes, until shrimp is cooked through. 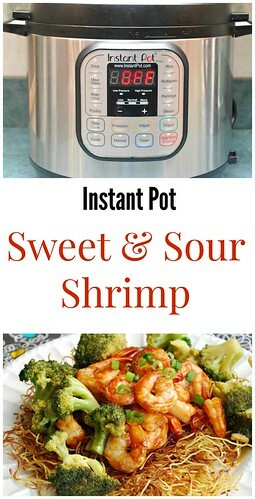 Add broth mixture to pan and toss with shrimp/broccoli to coat cook 1 minute. Serve over noodles or rice and garnish with green onions.